Launched 11 September 1861 by Portsmouth Navy Yard, the Kearsarge was a Mohican class Sloop of War that was best known for her defeat of the Confederate commerce raider CSS Alabama during the American Civil War. She returned home in August 1866 to the Boston Nay Yard where she decommissioned for repairs and then returned to active service protecting America's interest on the high seas until she was wrecked on 2 February 1894 on the Roncador Reef off the coast of Venezuela. Unable to be saved, she was struck from the Naval register in 1894, but since that time there have been five vessels of the United States Navy named after the Kearsarge, which was named after Kearsarge Mountain in New Hampshire, the current one being a Wasp-class amphibious assault ship. While other vessels in the Navy are named after the various states, the Kearsarge is named after the original Sloop of War made famous in the Civil War. In a time honored tradition dating back to the days of the wooden deck ships, the officers and men who served on the Kearsarge at the time of commissioning earned the title of "Plank owner". Every member of the commissioning crew would hold this distinction for life and each was entitled to a "clear, free, open and unencumbered title to one plank of the deck" upon the ship's decommissioning. The decks of the original Kearsarge were made from Red Oak Trees from Mount Kearsarge in Warner, New Hampshire and the shaft of this cane is made from the USS Kearsarge as stated in the inscription on the silver collar fastening the shaft to the knob. The inscription also shows the name Warren P. Webster, presumably the owner of the cane. Mr. Webster was active in the planning of the Kearsarge-Alabama Celebration Jubilee on Sept 17th thru 20th that was held in Portsmouth, NH and the 1930 census shows him still living in Portsmouth. The Knob, which is ivory, is inscribed P. Amerman * Constitution and we have not been able to find out any information on this individual or his relationship to the Constitution (Old Ironsides). 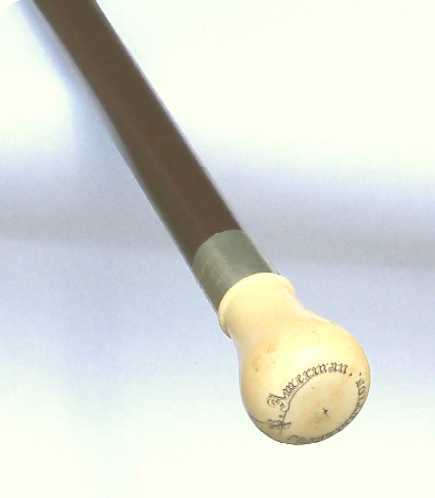 It is sheer speculation on our part from this point forward as to how the cane came to be, but it would not be too far afield to say that it was assembeled from a plank from the deck of the original Kearsarge, fitted with the ivory knob from another cane that belonged to P. Amerman and presented to Warren Parsons Webster as a thanks for his successful involvement with the Jubilee Celebration. In any event, this Relic Cane is beautifully made and is in very fine condition, measuring 32-1/2 inches from the brass ferrule to the top of the Ivory knob. A fine acquisition for the Nautical Collector, Cane Collector or Historian.